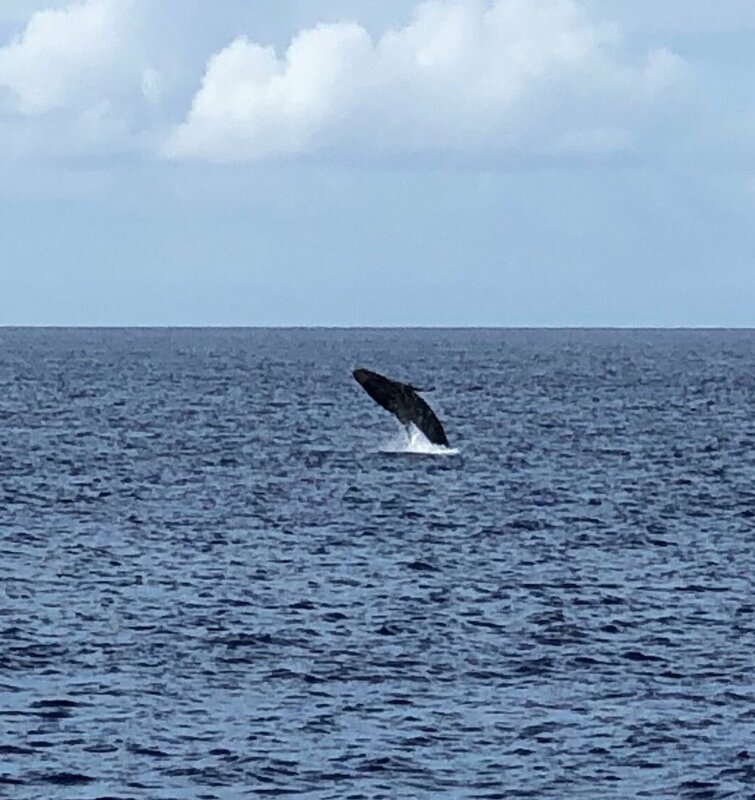 From late January to early March the shallow sea off the West side of Maui is whale soup. You can look out across it and at any time see 20-30 whales blowing, breaching, playing and diving. I make an annual pilgrimage to visit the whales; when a baby whale decides to check you out, with her 50 ft long mama underneath her, it is one of the most profound, moving and spiritual experiences you will ever have in your life. It is quite extraordinary and you can experience it one of several ways. On each of the first three of these you will have a naturalist with you explaining the behavior you are seeing to you and describing the history of the whales and their amazing comeback over the last 60 years. Pacific Whale Foundation takes larger boats out, best for the very young, the very old, or those who don’t like a rough ride. 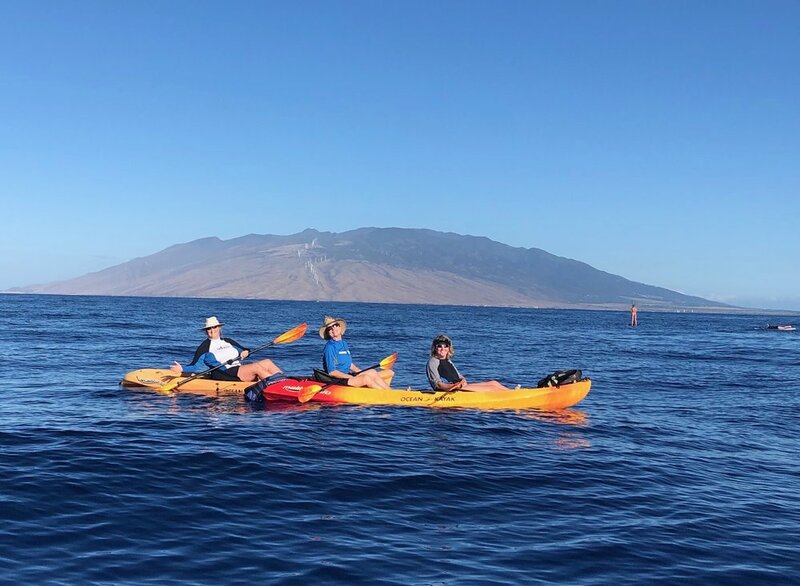 The trips go from both Lahaina and Kihei although my favorite is to go out on a single kayak from Wailea beach. If you go out early in the morning, at dawn, the sea may be like glass and you can see whale spouts from miles away. The sun comes up over Haleakala and washes the grey sea with pink and yellow colors. Your guides will look carefully to see where the whales are, which ones are being more active and then take you over to them. 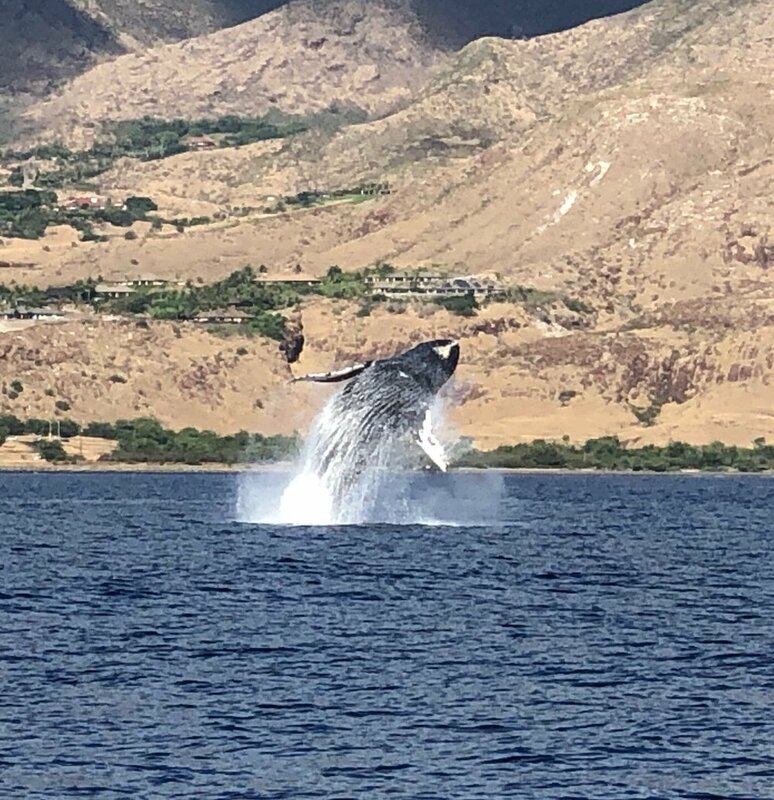 The holy grail is whales breaching (jumping high out of the water, twisting in the air and crashing back down) and this trip we saw both two fabulous examples. First was a baby whale of about 4-6 weeks old learning how to breach. His mother was with him and he would breach over and over trying to figure out how to do it right. Then, when he got tired, she put him on her nose and pushed him along as he practiced smacking his little tail on the water. He was full of energy and he was joyful to watch. I did 6 whale watching trips in 9 days and had several close encounters on every single trip. We were “mugged” by two adult whales who came up right next to our small boat (surprising us so even our captain jumped) and I had a close encounter with a 70 year old mama whale and her baby when on a kayak. She and her baby surfaced too close to me, well within the 100 yard distance we are supposed to stay away, played with her baby for a few minutes and then did a slow, elegant dive showing me her gnarly old tail. She has some stories I am sure. If you live in the US and have not seen the whales I recommend you find time to go and visit them. They are there visiting from Alaska from about mid January to about mid March. Your trip can be cheap or it can be expensive - the whales don’t discriminate! There are plenty of places to stay in Kihei, Wailea and Kaanapali (just north of Lahaina) for all budgets but my favorite is the condos at Wailea Beach Villas. Many excellent restaurants but Ferraro’s outside at the Four Seasons, at sunset, is hard to beat!